Another tank eclipsing 27mpg...I seem to be reaching a plateau of what the ol' Blue Bullet is capable of - without going too crazy. One thing I have been realizing...there are diminishing returns after a while. The initial increases are easy to come by, but each increasing mpg is harder to get than the last. One note about the actual total savings of hypermiling. You will save a lot of gas by driving at 55 rather than 65. However, it will also obviously take a lot more time to get to your destination. It is up to you to decide if your time is worth more than the gas you are saving. One of the keys that makes my hypermiling more economical is that I am mostly in stop-and-go city traffic, so my actual time differential is not that much, perhaps 5-10 minutes per day. If I had a mostly highway commute, the time difference might be much higher and thus less economical. And if I actually got paid for the short amount of extra time that it is taking me per day, I would not be coming out ahead...10 minutes per day X 250 days/yr = 2500 min = over 40 hours = a week's pay = more than I'm saving in gas. Unfortunately, I do not get paid for every hour that I am alive. And there are more savings than just the money that I do not have to expend. And gas prices are still increasing. So I will continue to hypermile...but I won't be driving 50-55 on the interstate much anymore, just to increase my stats. On the other hand, I won't drive 75-80 either. It is up to the individual to find the balance. As conventional energy sources begin to dwindle, we will need to rely heavily on renewable and alternative sources to provide the basic services we once took for granted. Researching and employing these sources can be a daunting task. This book provides a basic tutorial on many of these sources as well as strategies for adaptation for individuals, small businesses and communities. As the title suggests, it is geared heavily for small communities, so many of the projects highlighted are at a larger scale than the individual homeowner. Still, I found it to have some good information. The first chapters recap reasons why we desperately need alternative energy sources, namely peak oil. The author references The Long Emergency as an inspiration for this volume, however takes a more optimistic tack than Kunstler. While Kunstler goes out of his way to denigrate every possible alternative source, Pahl details how each of these sources are being used right now...and what the future may hold. The book covers the following topics: solar, wind, water, biomass, liquid biofuels and geothermal. Each topic is viewed from a small community point of view, with many examples of current projects. Unfortunately, the book does not delve much into cost analysis, only showing projects in the most positive light. If these projects are cost efficient or not is left up to the reader to research for himself. In the author's defense, cost benefit analysis varies greatly on a case by case basis, and has many variables to consider. For the casual reader, this book is not a must read. It does, however, provide a strong background in the majority of current alternative energy sources. If one is contemplating alternative sources for a small business, farm or community...I would recommend it. Also it would benefit local governmental leaders; mayors, city councils, home owner association boards, school boards, etc. 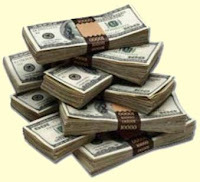 Here is a duo of articles from MSN concerning the growing financial ignorance of Americans. Considering the average American has negative savings, one could wonder about the message that sends our children. One also wonders about the lessons of large amounts of mortgage over-extensions and subsequent foreclosures. The first article mainly looks at ways for the public school system to increase financial acumen; which I applaud, but find lacking. I, for one, know I learned very little about basic economics from public school. I must have picked up my (for lack of a better term), shrewd, outlook on finances from family influences as a child. (I do remember reading a Consumer Reports-type magazine a lot as a youngster and putting my summer earnings in a passbook account.) Anyway, I think it is very important for parents to instill basic financial skills (money management, budgeting, work ethic, time value of money, basic investing concepts, etc.) at an early *yet age appropriate* time. Anything else is doing them a disservice which will have ramifications for their entire life. Money may not buy happiness, but not having it can surely bring a ton of grief. The second article examines ways several sets of families (with different sets of circumstances) attacked the problem. I think the best solution will be different for everyone. Drawing a balance between working, consuming and saving is a constant battle that most people have to face everyday. Passing on your values to your children will most likely happen whether you intend them to or not; I would argue it is better to shape the discussion on your terms. 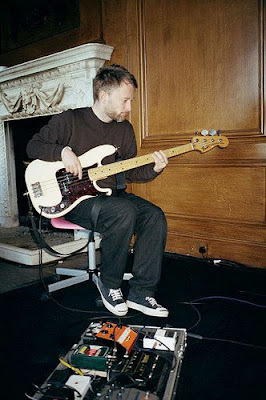 Radiohead, hit band & leader in the environmental community. "The band has called the digital giveaway a "one-off" experiment, but they've also re-examined other ways they conduct business. They last year commissioned a report from the company Best Foot Forward to judge the carbon and ecological footprint of their touring. Any adjustments are in the early stages, but the band has posted messages on their Web site urging fans to car pool to concerts. They caution that music is at the heart of any new endeavors." In Venezuela, cheap gas is considered more a right than a privilege. 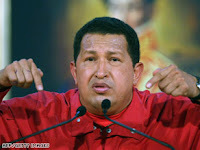 Several governments, including that of Chávez, have attempted to raise prices in the past. Those moves have often been met by riots and demonstrations, forcing successive presidents to back down. Hundreds, if not thousands, died in riots in 1989 when the government of former President Carlos Andrés Pérez was reported to be considering a gasoline price increase that would have also raised public transportation costs. Faced with mounting bloodshed, Perez quickly backed down. It looks like they will kill folks just for talking about raising the price. My question: who is going to get holding the bag on all the accumulating debt that this policy is creating? The article alludes to international lenders holding a large portion. Plant update: A little over-zealous fertilizer application claimed the life of the cantaloupe and singed the leaves of the cucumbers. They seem to be doing OK now, though. 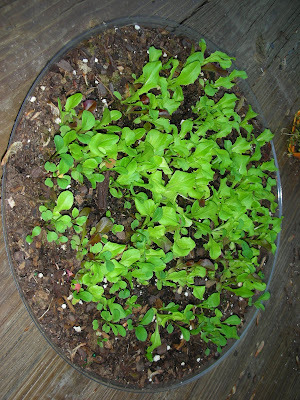 Here is also a picture of a shallow tray of mixed greens...they are nearly ready. It makes me ask myself, though...how ready am I? The true test of our transition from fossil fuels will be the availability and price of alternatives. As I stated in Solutions, Part II, conservation is admirable and necessary, yet limited. When the oil is gone, we are going to need something else...and this post will attempt to compile the majority of current favorites. As always, feel free to amend the list...hopefully there will be new breakthrough technologies that can truly change the game. WASHINGTON—Officials from the Institute for Somehow Managing to Hold It All Together warned that, despite their best efforts, everything appears to be falling completely apart and "getting way out of hand," according to a strongly worded report characterized by panic, frustration, and numerous typographical errors that was released to the American public Monday. "The country today faces a number of pressing issues, including potential economic collapse, the continued threat of global warming, and the decaying national infrastructure," ISMHIAT chairman Kenneth Branowicz said during a press conference to announce the study's findings. "And we just can't keep it together anymore." It might not be the end of the world, just the end of the world as we know it. The article claims it may be good in the long run...I do not agree. I think the best thing in the long run would be a slow transition from oil. One that does not have any large price shocks and depressions. Depending on how quickly we find economical alternatives and how much worldwide demand is affected by rising prices, I feel this is possible. We may not have much of a choice in the matter, however. It seems as this speech could be ripped from the headlines in the near future. Unfortunately for Carter, folks didn't take to well to the bad news...and a little over a year later ushered in Reagan on a charter of hope and optimism. 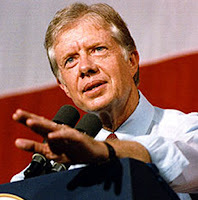 Much of the problems he noted were temporarily resolved by increased oil production in Alaska and the North Sea, slight conservation initiatives, as well as drastic tax cuts. Over two decades of extreme growth ensued, encompassing the fall of Soviet Russia and the explosion of the personal computer. The question now becomes, what will save us next time? Here's a website that provides listings of farms that produce organic foods. 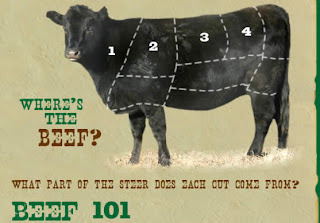 You can find organic produce and grass-fed meats near you. Also see Local Harvest for a great resource for farmer's markets, CSAs, and other local foods. Could you stand to lose a few pounds? Perhaps just concerned with eating right for health reasons? Have you ever noticed that it seems just about everyday there is a new 'breakthrough scientific study' that claims to have found the holy grail of nutrition? Perhaps it is a low-fat diet...or low-carb...more antioxidants...maybe we just need more omega-3s? Does it seem like a lot of this information tends to contradict previous findings, which in turn, is contradicted again? I found this book to be an eye-opening look into why this has been occurring for over the last century. The author examines the origins of 'Nutritionism'...the phenomenon of applying science and technology to essentially replace our ancestor's food chain with The Western Diet. Beginning in the early 19th century, scientists discovered the basic building blocks of food: Carbohydrates, Protein and Fat. A little while longer they discovered a few basic nutrients (vitamins) and proclaimed they had solved animal and human nutrition. Soon after, the first baby formula was created (consisting of cow's milk, flour and potassium bicarbonate). Nutritionism was on its way. Unfortunately, doctors began to notice that babies fed exclusively on this diet did not fare especially well...undeterred, the food scientists forged ahead, looking for the magic formula for human nutrition. The author continues to explore the Age of Nutritionism, from the advent of processed grains to the low-fat phenomenon of the late 50s-present to the low-carb craze of the turn of this century. He highlights that current scientists, in some respects, are just like the early ones. There are just far too many things that we just do not know about how the human body utilizes food. Out of The Age of Nutritionism was born The Western Diet. Highly processed foods, shelf stable and able to be transported around the globe. A plethora of foods sources were distilled into about 4 monoculture grains (corn, soy, wheat, rice) and 3 protein sources (beef, pork and chicken). These staples were then bred for maximum production at low cost (a worthy goal when there are poor, starving people), however this came at a cost of nutritive value and flavor. The author then describes the after affects of the adoption of The Western Diet. After industrialization, native peoples quickly began to contract 'western' diseases (hypertension, diabetes, cancer, etc.) when previously they had very low rates. Pollan describes a study of modern aboriginals who had a wide range of maladies simply disappear after returning to a bush diet for several weeks; foraging for plants, grubs and wild game. As you may know, the U.S. has very high rates of obesity, hypertension, cancer, and heart disease. Much of the increases in life expectancy have come from preventing infant mortality, not actually extending life spans. In the near future, we may actually see a decrease in life expectancy. Much of this, Pollan argues, is due to our diet. Food scientists can break food down into parts, but it has a harder time putting it back together. And even if they could, do we really know the optimal configuration? Perhaps someday we will...but until then? What can we do? Must we return to a hunter/gatherer existence to save ourselves? Fortunately, no. The author suggests only simple, basic guidelines: Eat Food, Not Too Much, Mostly Plants. Out of these basic guidelines, there are some sub-bullets I would like to highlight. I highly recommend this book. It has really affected the way I think about food. I have always subconsciously been in the nutritionist frame of mind...the body is a machine and food is its fuel. This book sheds light on a counter-claim; that food is actually a relationship between many things, both living and not. I invite you to investigate this yourself. I would caution that while our diets constitute one portion of our health, it is not the only determinant. Our ancestors also had much different activity levels than we in modern societies do today. I am a strong believer in the power of exercise, which is not in the scope of this book; but in my view, cannot be left out of any discussion of health. 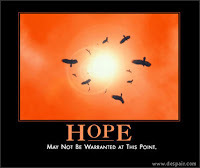 I also am an optimist in regards to science. While our scientists may not currently hold the keys to the universe...does that mean we should not implore them to keep looking? Does anybody think we'll ever see sub-$3.00 gas again? Does the nation have sufficient wind energy resources? What are the wind technology requirements? Does sufficient manufacturing capability exist? What are some of the key impacts? Can the electric network accommodate 20% wind? There are significant costs, challenges, and impacts associated with the 20% Wind Scenario presented in this report. There are also substantial positive impacts from wind power expansion on the scale and pace described in this chapter are not likely to be realized in a business-as-usual future. Achieving this scenario would involve a major national commitment to clean, domestic energy sources with minimal emissions of GHGs and other environmental pollutants. 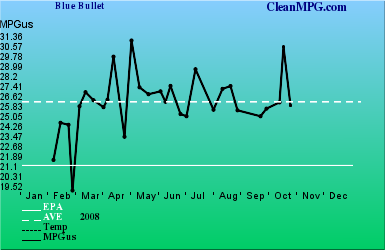 While it is surely encouraging, it unfortunately lends to my assertions that there are no silver bullets. Even with large scale growth, wind will only provide a small portion of our future needs. A worthy endeavor to strive towards...as it seems wind could technically supplant the 20% that is currently provided by natural gas. Goldman Sachs is forecasting a continued rise to oil prices for the rest of the year... in spite of current fundamentals that might support a price decline. The near-term oil market is being driven by ``long-dated'' prices, or the price of oil for delivery 5 years forward, Goldman said. While an increase in U.S. stockpiles and declining demand growth due to the global economic slowdown is creating ``near-term fundamental weakness,'' this is not causing lower prices, according to the bank. A look into the difficulties in determining the future of oil prices...lack of data of actual reserves and heavy speculation make the futures market very hard to read. I have a feeling we may get a small reprieve in the coming year...but for the long haul? The only place it can go is up. If enough people feel the way I do, we might not get any short-term reprieve. Another look into the *all* the causes of food price increases and the potential for biofuels to begin to fill our massive appetite for energy. Here's a new picture of the hanging planters. Some of the plants got a little battered during the heavy rain and wind of the past few days. Everything still seems to be attached and growing well. You may notice the green bottles in the top...they are supposed to provide a water source. They consist of a 2-liter bottle with a specialized plastic spike on the end. The theory is they are supposed to only let out enough water seep out to keep the soil moist, but I've had trouble keeping them filled. They seem to be working today, as they were about half filled with rain water. I'll continue to experiment with these to ensure sufficient hydration during summer vacations. Just saw an ad for this on TV, so I thought I'd give it a peek. While it does seem informative, the lack of relative comparison leaves the statistics somewhat undefined in my mind. I am going to keep reading and try to give a more critical review later. I am also working on a critical review of the DOJ's approach to antitrust regulation of the agricultural marketplace. (i.e. how is the gov't doing regulating ag giants like Monsanto). I'd like to send a Happy Mother's Day greeting to all the maternal influences in my life. The unconditional love, appreciation of learning, hard work ethic, and courage to take a stand that you have exhibited certainly touched many lives, including my own. Today is your day. A piece of legislation: "To amend the Internal Revenue Code of 1986 to impose a windfall profit tax on oil and natural gas (and products thereof) and to appropriate the proceeds for the Low-Income Home Energy Assistance Program". How do you think this would affect energy prices? Is it a good idea? 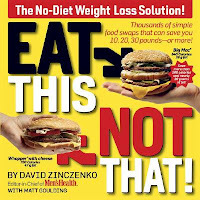 I just finished skimming through Eat This, Not That by the editors of Men's Health magazine. It is a popular (it was on wait list at the library for several months) handbook for healthy food substitutions. It is primarily geared towards casual dining and fast food restaurant eating, but has sections pertaining to grocery shopping as well. You may notice I said I only skimmed the book. I got to page 'xii' in the introduction of "Top 10 Swaps". For burritos it told me to eat a Taco Bell Regular Style Steak Burrito Supreme instead of a Chipotle Steak burrito. I nearly put it down right then. Sure the Taco Bell burrito has less calories and fat...it's smaller. I can normally be sated with one Chipotle burrito. I've never just eaten one Taco Bell offering, and my stomach rarely lets me forget it. You can't tell me *pound for pound* anything at Taco Bell is better than Chipotle. With the author's credibility severely damaged, I warily continued. As I flipped through I was struck by a combo of typos, contradictions and carb-phobia. Carbs are not evil, people. While only giving it a cursory glance, I found two cases where they recommended to both 'Eat' and 'Not Eat' a certain food (Goldfish Crackers and Kraft Zesty Italian Dressing). I will continue to eat both of these. While I would not recommend this "book" (more of a glorified magazine), it had several redeeming qualities. First, the basic concept is sound. There are easy substitutions that you can make every day that can save calories (like don't put so much cheese, bacon and ranch dressing on stuff). Over time these small savings can prevent weight gain. I just don't know if I would trust anything in this book. It is not a "no-diet, weight loss solution" in my opinion. Secondly, there is a section called "8 Foods You Should Eat Every Day". Spinach, yogurt, tomatoes, carrots, blueberries, black beans and walnuts; each with several similar substitutes. All-in-all I'd say those are pretty good choices. Bottom line, if you want to improve your diet: Read this (Advanced Sports Nutrition), Not that. Alright folks, finally something of substance. For all of the E-85er's out there who have trouble finding a station that actually has the fuel (which as a side note - I scoff at the thought of ethanol being the main driving force of escalating food prices, much like Chief said in previous posts), here is a website that has station listings. Just plug in your zip code and within seconds, power and that juicy fuel is at your finger tips. Added bonuses - E85 merchandise, recent news, and membership capability if you are interested in getting an E85 station or pump in your town. There is a ton of info and in all honestly, I have just glossed through a lot of it. Dig in, folks! General info site. Surprisingly enough, maybe not as of late, but more so when I first had my E-85 capable car, most who saw the little emblem on the side of my ride did not know what it meant, and even less about E-85 capabilities. One final note - Drink Miller products (made of corn) and Go Cubs! 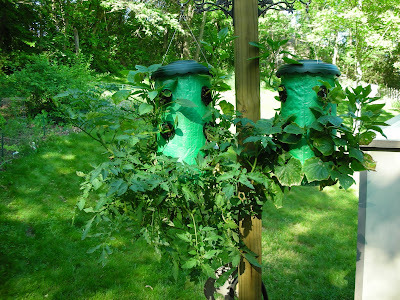 Here's a photo from 4/28/08 of the 'plug-n-gro' bag experiment. Our garden seldom gets full-sun exposure, so we'll see how these new hanging gardens fare. I'll try to provide updates throughout the season. Also new this year will be 2 plum trees, 4 blueberry bushes, and black/red raspberries. The bags hold 12 plants each, with a wide variety of vegetables represented: tomatoes, cucumbers, peppers, squash, cantaloupe, and zucchini. Pushing his new book, A World Made By Hand, fiction set in the Long Emergency. "You're probably one of those people that thinks the world has a creamy nougat center of oil, but it doesn't." Investment bank Goldman Sachs portends more gloom and doom in their latest oil futures prediction. A search through their previous prognostications seems to back up the story. They were some of the first to predict triple digit per barrel prices. The "super-spike" theory argues that a lack of adequate supply growth along with price-insulated demand growth in non-OECD countries will lead to a dramatic and continuous rise in oil prices that will ultimately lead to a sharp correction in oil demand. Here's a video from the Heritage Foundation listing 5 ways to lower gas prices... along with my comments, of course. This is a very key point. We all should educate ourselves on how oil (and food and other necessities) is produced and marketed. Here is an article explaining the basics. Basic supply and demand is a main contributor to prices, but it is more complex than that. As the speaker noted there is potential for regional shortages due to refining capability and mandates for various formulations of gas. I believe there are environmental reasons for all the formulations. Less smog/particulates for higher pop. density areas, etc. I'm not real sure on how much it affects price, and if you pass that cost into externalities...smog, asthma, lung cancer, etc. are you actually saving anything? I don't know. I am not fundamentally opposed to drilling in protected federal reserves (although you have to chuckle when he claims there will be no environmental effects). However, I am skeptical of the 'enough oil to power 60 million cars for 60 years' figure. Estimates for the Arctic National Wildlife Refuge (ANWR) economically recoverable reserves are anywhere from 5 to 10 billion barrels. Considering the U.S. currently consumes over 20 million bpd, this would equate to 500 days. There may be other fields that provide more, but I'd have to do some more research on that. Seems a bit fishy. It is my view that we should probably hold off on tapping our last reserves until we *really* need it. Let's use up the Saudi's oil at $120/barrel and use ours at 200+, which actually may not be too far off...hmmm....maybe we should start looking into it a little. It does take time to begin to exploit a new field. Bottom line, drilling more only buys us a little more time. It will give us temporary lower prices, but may remove incentive for transition off oil. We must begin to transition to cheap alternatives, which currently do not exist. After the 70s oil crises, large drilling efforts in Alaska and the North Sea led to a large oil glut that allowed us to get complacent again. There is only so long that can continue. If we could ensure that the oil was used for the transition (research, building infrastructure (nuke/solar/wind plants, maglev trains), industry, agriculture) and not for allowing folks to commute cheaply in SUVs, I'd be on board. We need to begin construction of the latest generation nuclear plants ASAP. The latest technologies are much safer and produce much less waste than the 60s and 70s era technology that we currently are using. Considering the majority of our electricity is produced from coal and natural gas, and electric vehicles are going to increase demand in the near future, nuclear power will be imperative. Refineries, on the other hand, may not do us much good. If peak oil is truly upon us, do we need more refining capability? There will only be less crude produced from here on out, so we should be able to handle refining it. Other than maintaining or slightly increasing the current capability, I don't see why this is necessary. By now, you should know my stance on ethanol. It is a fallacy to say ethanol is the main cause for U.S. food price increases, I'll leave it at that. I agree that the free market is a powerful thing. It has already begun to lower demand. It will also provide alternatives to oil. Unfortunately, they may include horses and bicycles, however. Depending how gradual our transition is, the market may have time to find alternatives that continue a standard of living that is near what we currently enjoy. However, if we continue to stall and ignore the problem, the free market will solve it in sudden, and perhaps violent ways. One of the scariest statements the speaker makes is: "any fuel that needs a subsidy to compete with 120/bl oil is never going to be affordable for consumers". He is correct. There are no alternatives cheaper than oil right now. There may never be, especially without providing resources for research and development. We may have to re-adjust what we consider 'affordable'. The Heritage Foundation is not making the Long Emergency seem any less likely in my eyes. It also speaks to our lack of actual production, a trend that has bothered me. America produces very little anymore, only services. I feel this lack of production capability will come back to haunt us when the wheels of globalism (cheap transport and cheap labor) begin to slow. That being said, you can't beat the prices at Sam's...but are we really considering all the external costs? The only problem I see: If consumption decreases, then demand for production decreases as well. We'll all have a lot of free time if we don't have a job at all. It seems to be a rather fine line that must be maneuvered. Thoughts? Thanks for the invite, Chief. I'm currently hiding from the box in my apt. I will be posting something interesting (more likely funny than informational) in the next couple of days. If you filed a 2007 tax return and didn't make too much money, you should be getting a check from the IRS very soon (or already have). I've been thinking about ways to spend mine. It pretty much breaks down into two categories, Save or Spend. 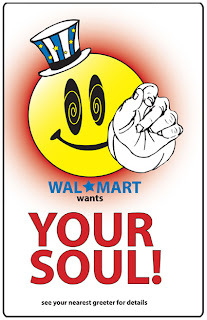 I've tried to think of ways to spend that would actually stimulate 'y/our' economy, and/or stave off the LE. Most could be considered investments, for what it's worth. The Long Emergency by James Howard Kunstler is a sobering view of a post- 'peak-oil' America. 'Peak-oil' refers to the point in time when the maximum rate of global petroleum production is reached, after which the rate of production enters its terminal decline. Basically, the point when we've pumped out more than half of the oil that has ever been created. There are many estimations for when this will occur, as there are many factors that make it nearly impossible to predict. For instance, it is in the producer's best interest to keep their reserves secret...Saudi Arabia has maintained that they have around 260 billion barrels, but that figure has not changed in 40 years. Sure, we can keep finding new reserves and creating new technologies that allow us to reach oil that was previously uneconomical...but this cannot go on forever. Kunstler takes a rather pessimistic view, saying the peak will occur between 2000 and 2010. This means we have used about half of all the oil that was ever created...great, right? That sounds like we have plenty of time. The only problem is the world uses a bit more oil these days than it has in the past, actually a lot more. In fact we've used 25% of all the world's reserves in the past decade. The author estimates at current trends, we have about 35-40 years left of oil...the oil that is the hardest to get...and if it takes more input energy than you get out, it is not a winning proposition. Bottom line, we WILL run out of oil someday, it's only a matter of when. The optimist in us all believes that some magic technology will rescue us, perhaps some alternate fuel that is in the works right now. The author does a pretty good job of systematically raining on the parade of every legitimate alternate fuel source. Natural Gas, Hydrogen, Fuel Cells, Coal, Hydroelectric, Solar, Wind, Synthetic Oil, Thermal Depolymerization, and Nuclear are all discussed and largely discounted. After a few chapters discussing how he feels global warming is going to get us and how the global economy is destined to fail and how the suburbs are the bane of human existence, he hits us with his view of life in America without cheap oil: The Long Emergency. I'm not going to ruin the ending, you'll have to check it out for yourself. I will just say that the book is very pessimistic, and at times it seems as though he is relishing the thought of his post-apocalyptic existence. The biggest problem with the book is that I can't really find too many faults with his logic (he was wrong about Y2k, however). Peak oil is either upon us now, or will be in our lifetime. Any alternative that we currently have is either more expensive or has other major drawbacks. I feel it may come down to not 'if'; but 'when', and 'how severe'. I highly recommend this book. While I don't think (and certainly don't hope) the future will be as dire as depicted; I do think there are some important insights to be gleaned concerning overall trends that could be instrumental in making sound long-term decisions: where to live/retire, employment, investing, etc. These insights can also be leveraged in everyday decision making: what we eat, what we buy, who we buy from, etc. ; that may lessen or even prevent The Long Emergency. But you don't have to take my word for it...head down to your local library and check it out for yourself. Edit: The first 90 pages can be found here. Assertion 1: I'm not going to argue that using corn for ethanol does not increase grain prices. Obviously, it has an effect. But is it the main effect as some would have you believe? Enough to be deemed a crime against humanity? There are many causes for increased prices: Higher demand...more people in general, massive amounts of populations attaining affluence allowing them to eat 'western diets' (FYI...China eats more pork than the US...PER CAPITA), biofuels, increased investment in commodities markets, lower dollar value. Lower supply: Droughts in Australia, flooding in Philippines, increased input costs (oil, petrol based fertilizers). It seems to me that all of these causes have an effect, and singling out biofuels as a main cause is a tad unfair. One could then argue that biofuels are optional and unnecessary. My view is that grain is a commodity equal to oil. Without oil, we have no food. We are not morally obligated to provide cheap food to the world any more than the Saudis are obligated to continue to provide us cheap oil. It is imperative that we find a way to create new economical sources of fuel, or the gravy train known as the agricultural revolution is coming to an end. 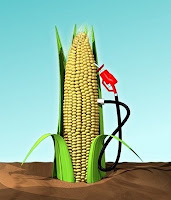 Corn-based ethanol is not a solution, but in my view, it IS a stepping stone to the solution. For example, an 18-ounce box of corn flakes contains about 12.9 ounces of milled field corn. 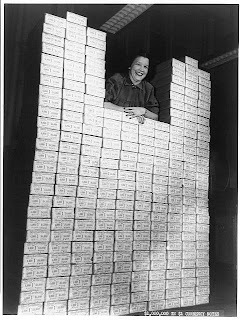 When field corn is priced at $2.28 per bushel (the 20-year average), the actual value of corn represented in the box of corn flakes is about 3.3 cents (1 bushel = 56 pounds). (The remainder is packaging, processing, advertising, transportation, and other costs.) At $3.40 per bushel, the average price in 2007, the value is about 4.9 cents. The 49-percent increase in corn prices would be expected to raise the price of a box of corn flakes by about 1.6 cents, or 0.5 percent, assuming no other cost increases. The article also does a comparison for high fructose corn syrup in soda as well as the effect on meat. Meat has a higher sensitivity to grain prices, as one would imagine, but the average American diet is hardly deficient in protein. My average fuel economy has risen from around 20mpg to a solid 25.9mpg. I now have 2 recent tanks that have surpassed 30mpg, so I fully expect to continue to improve my average, especially now utilizing summer blends of gasoline. 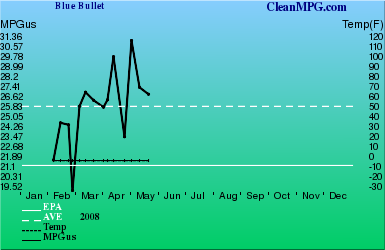 I calculate over this time period (abt 3 mos.) I have traveled 3600.4 miles using 138.8 gallons of gas (at an average price of $3.09) If I had not improved my fuel consumption, I would have used 180 gallons of fuel over the same distance...costing me an extra 41.2 gallons and about $127 (note at today's prices that is more like $145). For those of you who have begun to use some of the techniques in the article I suggested, you may have found it hard to determine precisely how much acceleration to use and noticed that any feedback is delayed until you fill up your next tank. This makes it nearly impossible to fine tune your driving style, as any positive or negative feedback is all lost in the noise, which can be very frustrating. The remedy for this is an instantaneous sensor that plugs into your car's computer, sending you nearly any type of data that you could possibly need in real-time. Now you can tell how much fuel you are using during different rates of acceleration allowing you to tailor your driving style to maximize fuel economy. I highly recommend purchasing one if you would like to truly maximize your car's potential.